“On the 5th October I am taking on the challenge of trekking 6 days on various parts of the Wall of China I have been thinking about this for a few years! Last year after joining Ramblers my friend Margaret and I decided we both had the desire to do something that would push us to our limits but at the same time fulfilling a dream we both had. The trip is with a small group of 12 people and we begin our journey in Beijing. The trip walking the wall is 6 days continuously and the terrain is different on every section. See below a picture of an area we are doing. Finally the trip ends with a visit to the Terracotta Warriors. I have been walking all year trying to prepare for the trip but as it gets nearer the nerves are starting to kick in! Hence the reason I have decided to do the challenge for a charity which is extremely close to my heart. As many of you know I have battled breast cancer and there are lots of charities out there supporting all forms of cancer so I have decided on MND (motor neurone disease). Good Luck Christine! I will be thinking of you. 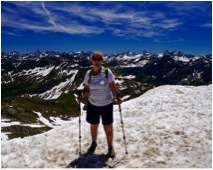 A fantastic challenge for a fantastic cause, well done Christine and a massive good luck on your trek. Can’t wait to see the photos! Wow Christine, what a challenge. Good luck – will be thinking of you and look forward to hearing all about it and seeing pictures too. Great cause too and so true, this horrible disease doesn’t get the publicity or funding it so deserves, so congratulations for choosing it. I have donated to your fund. Scott would be proud of you Christine and smiling at your challenge.